I feel we have had enough warmer days now to both shed the coat, don open toe shoes and start looking forward to the Summer. The question is, while most of us wear sun cream to protect our skin, are there plans in place to take care of the hair? A vast majority of my patients have damage to their hair recently and would like to prevent you from ending up in the same position. 1. Preventing breakage is much less work than trying to correct it! Have you ever considered the fact that we want to wear our hair a lighter colour in the Summer may be a little daft and any definition gained in the salon chair will be lost the minute we feel the sand between our toes? This also stands if we want to “strip out” a colour as a degree of bleach need to be used here too, maybe this “correction” should be a Winter project when the SPF is lower? If you are considering colour soon in preparation for the summer period- these tresses need protection. As mentioned above, sun acts like bleach and permanently lifts colour out of your hair, this causes the shaft to become more porous and often the leads to breakage and frizzy looking hair. 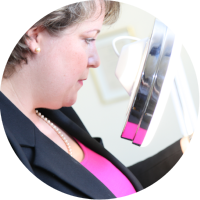 There are several factors in addition to what you are doing or not doing to the hair externally which would be discussed in a consultation with me. A blog such as this is fairly general but a bespoke treatment plan with improved dietary factors, lifestyle and perhaps slightly different hairdressing choices would be completely unique to you. I suggest an intensive conditioning mask is used such as Elasticizer by Philip Kingsley. Used weekly on damp hair really reduces the porosity of the hair, gives added strength and elasticity (hence its name) and prevents further breakage. This is a treatment we offer “in-house” at Sussex Trichology and worth mentioning that apart from hair loss and scalp conditions, we also treat out of condition hair too. The environment can have some of the most damaging effects of hair in both summer and winter because often we don’t take many precautions to protect their hair. I have heard so many times “I went out to the garden to pick a few weeks and 2 hours later I was still there, I didn’t realise it was that hot!” It’s wonderful to enjoy the feeling of sun on our faces: but of course while driving, for example, the sun’s rays are literally magnified- leading to burning and skin damage. Spare a thought for the hair where it may not be immediately obvious that the damage is going on. 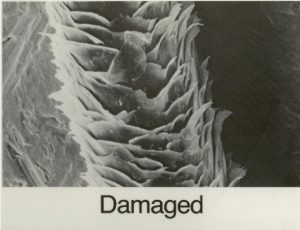 Take a look at the hair above, this magnified thousands of time to show just how damaged the cuticle of the hair can become. This damage is caused from backcombing but a tight round hair band would do the same, the continuous rubbing on the same area (if for example, you wear your hair in the same style each day) can simply rub the hair away. I am a fan of invisibobbles as they spread the surface area the tension puts on the hair shaft, they appropriately describe their bands as “knights in spiral armour”- love it! Hopefully, you have regular trims and are washing the hair daily as we wash our skin each day, the scalp skin behaves in the same way, and this is the very best habit. If however, you insist on blow drying and possibly even using the dreaded straighteners (you know who you are)! Then a cool setting with the hairdryer used a head distance away from the hair and ideally only used to finish off the styling process, is preferred. It may be obvious to most, but if the hair is split the only destiny for “Fragitalis Crinium” is the hairdresser’s floor:( these split ends will not heal themselves and have to be cut. 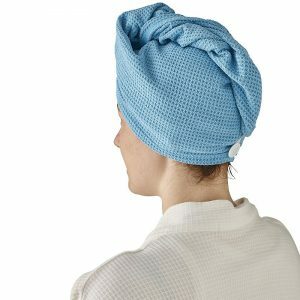 Try using a towelling hair turban that can start off the drying process without harm and if absolutely necessary then use the cool dryer briefly, you can buy these from other stores, however, the microfiber is harder to find- hooray for Lakeland! 3. Nutrition plays a part, too! Non-vegetarians: 2 portions daily of an animal protein- such as 200g of chicken or 250g of salmon will each benefit the hair formation for up to 6 hours per portion. This has the added benefit of delivering just the right amount (if absorbed) of essential amino acid, to aid things such as iron absorption. A subject I will cover in another article as it’s too important to cover briefly here. Vegetarians: We can obviously find proteins in other food groups such as nuts, seeds, tofu, hummus, soya, etc. However, due to the fact, these do not store as effectively as first-class animal proteins, need to be consumed more frequently. A handful of nuts, even those with high selenium content such as Brazil nuts, would still only benefit the structure of the hair shaft for up to 2 hours per portion- planning ahead would be the key. Assuming we are using shampoos and conditioners that are the very best quality and viscosity for our hair type. We are trimming the hair regularly, minimising the amount we brush or comb the hair in an aggressive manner. Turning down the heat of our hair dryers and irons (if not cutting out the use altogether) the hair will thank you in return. Depending on the length of your hair, a typical damaged head of hair (for example from a hair band worn too tight, repetitively in the same location) could take between 9-12 months to grow out. While I appreciate a large majority of readers will have a “heat protection spray/serum” already, consider; when you apply something containing a high concentration of oil, how can it actually protect against the heat of up to 270 degrees? (Typical straightener temperature). Read here to access information on children hair loss and scalp conditions. 5. How shall we protect our hair with an SPF (to prevent green hair)? Green-tinged hair is caused by the hairs reaction to the copper ions in chlorine and is most prevalent in those that have naturally blond or bleached hair. Most people associate this colour change with swimming in a chlorinated pool, and quite rightly too. Chlorinated pools often contain copper algaecides – a compound that helps prevent the growth of algae. There are a few things that can be done to avoid getting green hair. One is to wear a swimming cap in the pool or use a waterproof protective hair product such as swim cap. If you already have green-tinged hair, a lemon juice rinse can be quite effective. When we hear “SPF”, we think sun lotion for the face and body, poor old hair often is forgotten! This Philip Kingsley cream works just like wearing an actual swim cap and can be used a little like a serum on the ends of the hair or more throughout the length before swimming in the sea or pool. It is suitable for children too. Thank you for reading, enjoy your Summer! My 12 yr old daughter looks like her hairline is receding?? Could this be true? She had long, thick hair and has recently reached puberty. What can we do?